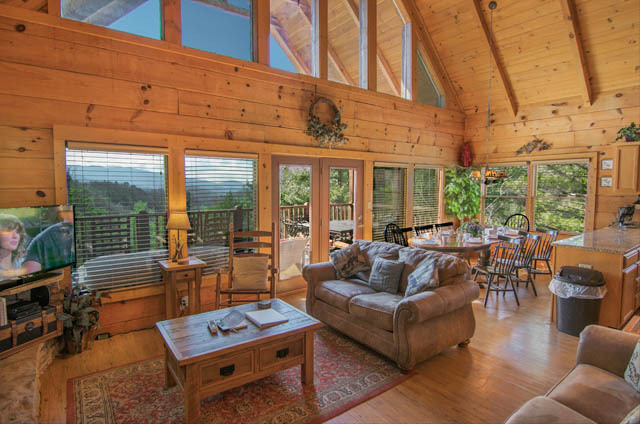 Setting: Secluded – Mountain Views! ….See our Online Guestbook here! 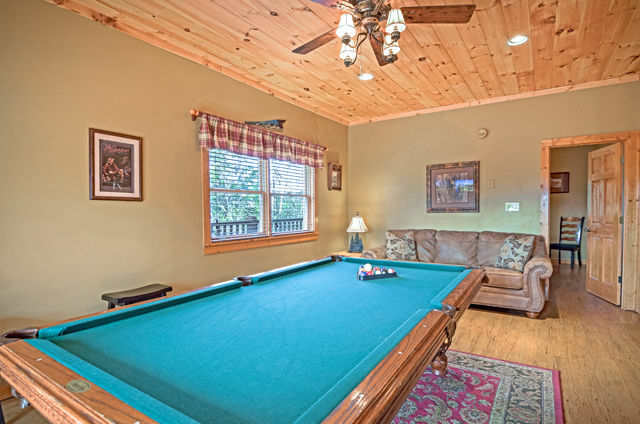 Game Room – pool table! 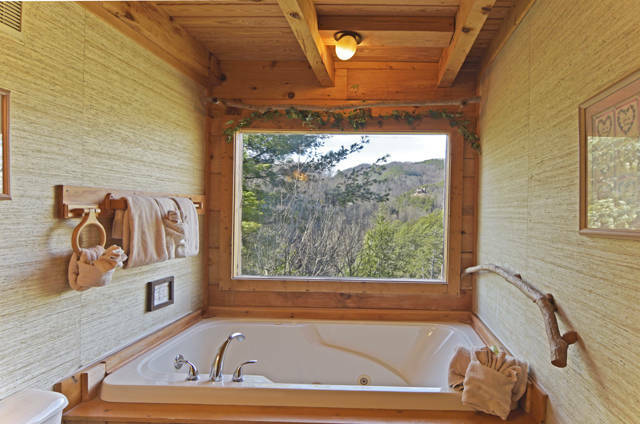 Hot Tub with mountain views – secluded! Gas Log Fireplace – season! access Fishing Pond – catch n release! Satellite Tv – 100+ sports-movies-local – DVD! 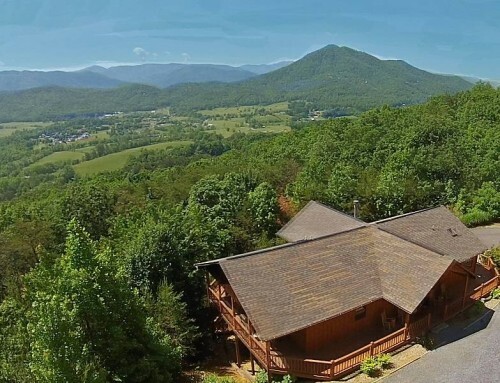 Awesome Mountain Views – see mountains not cabins! 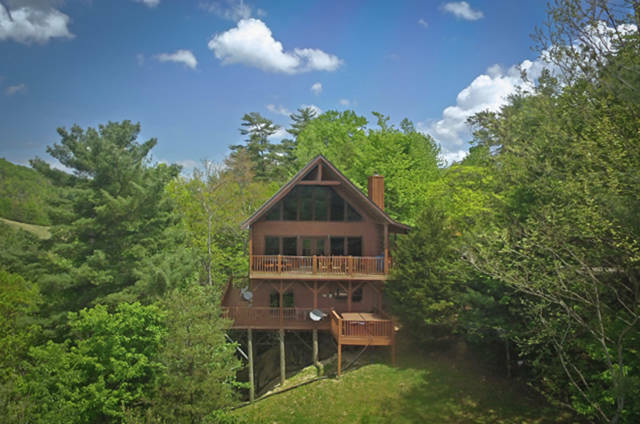 Secluded setting in a quiet peaceful community! 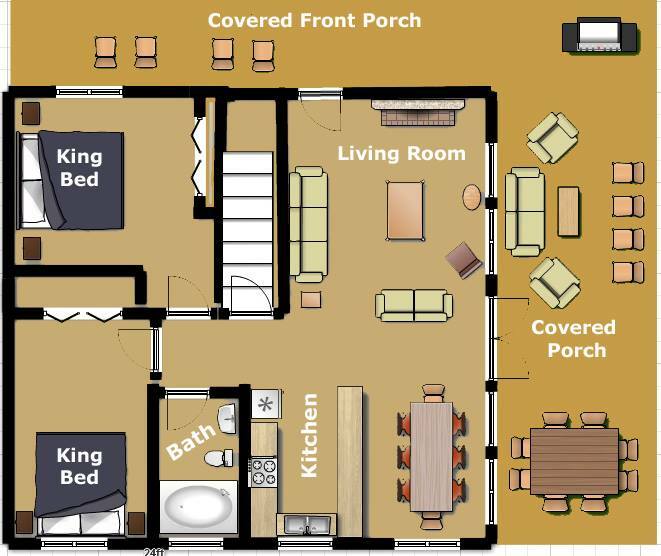 Central Location – minutes to attractions and sights! Wide Paved Road – not steep – paved parking! Authentic log cabin – cathedral cielings! Two steps from parking to entrance! Perfect for reunions, small weddings or vacation getaways! Express Check in – drive straight to the cabin!  Good Cell Phone Coverage (verizon, att)! 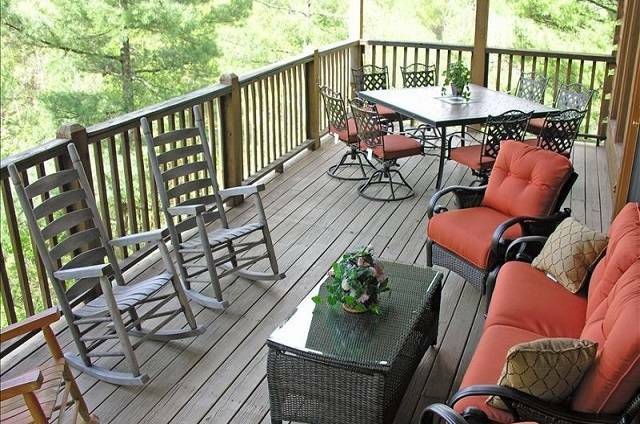 Occasional outdoor patio set & rocking chairs! Patio Set – Eight Chairs! 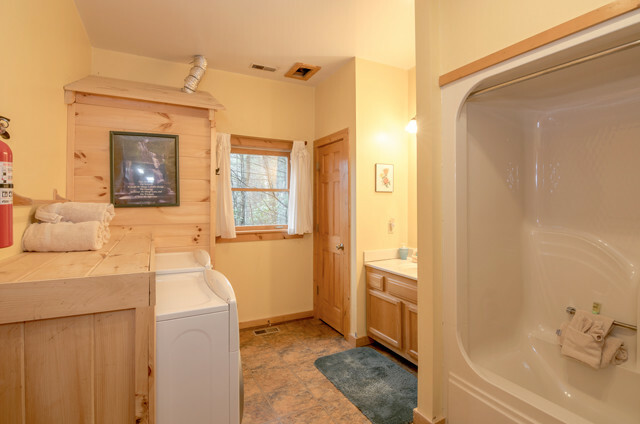 Washer/ Dryer – full sized! Experience a beautiful authentic log cabin that features magnificent views of the mountains from a secluded and quiet gated community. Heaven’s View features an entrance that is an easy two steps up from the parking area to the porch. 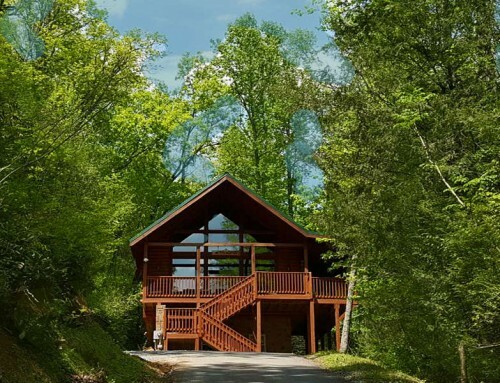 The covered porch then wraps around from the front of the cabin to side where there is a spacious deck full of comfortable occasional furnishings and a large patio table from which you can sit and soak in the beauty of the Smoky Mountains! Come inside and see the living room area that has high vaulted cathedral ceilings that span over the living room, dining room and kitchen area. There is a wall of windows that run from wall to wall and up to the cathedral ceiling making the cabin bright and airy. Your family will enjoy the lovely stacked stone fireplace where everyone can gather around on a cold night. The kitchen with Its upgraded granite counter tops, dishwasher and microwave have all the comforts of home. On the main level are two king sized bedrooms. The full bathroom featuring a Jacuzzi tub with a large window from where you can enjoy the view of the mountains while relax in the jetted water! 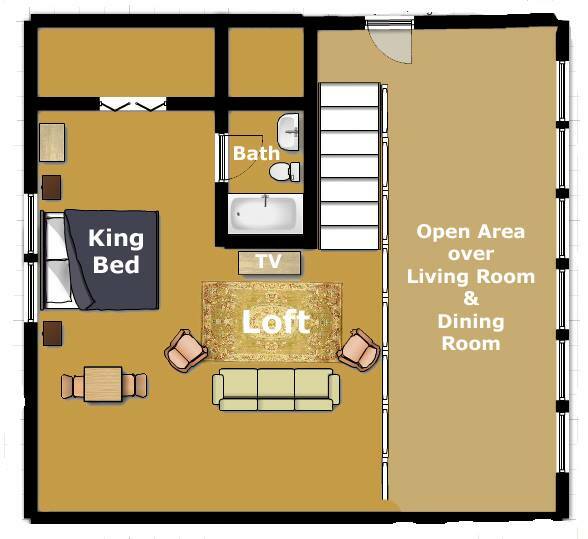 There is an open stair case to the loft from the living room that opens up into another sitting area with a futon and television. Behind this sitting area there is a king bed in a large loft with high cathedral ceilings and a full bathroom. If you take the stairs down from the living room you end up in the game room. 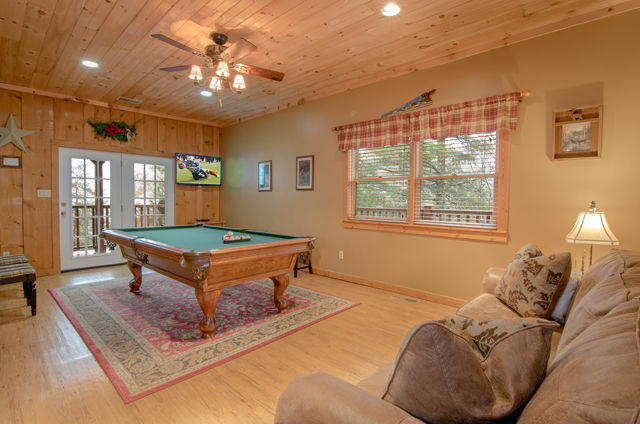 Everyone will enjoy playing a friendly game of pool or just sitting on the sofa watching a game on the flat screen television that hangs on the wall. 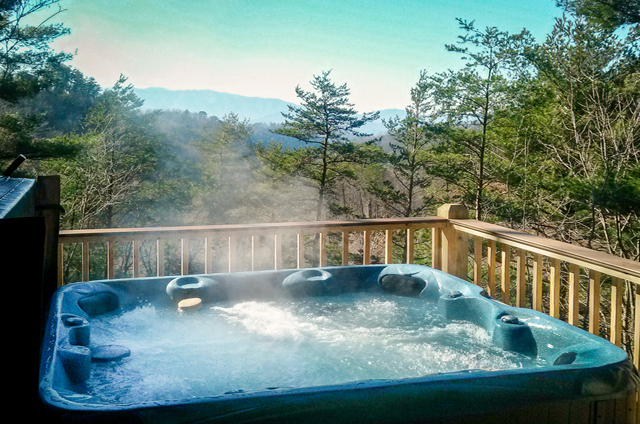 Or go out to the deck and relax while soaking in the hot tub enjoying the seclusion and the mountain view! 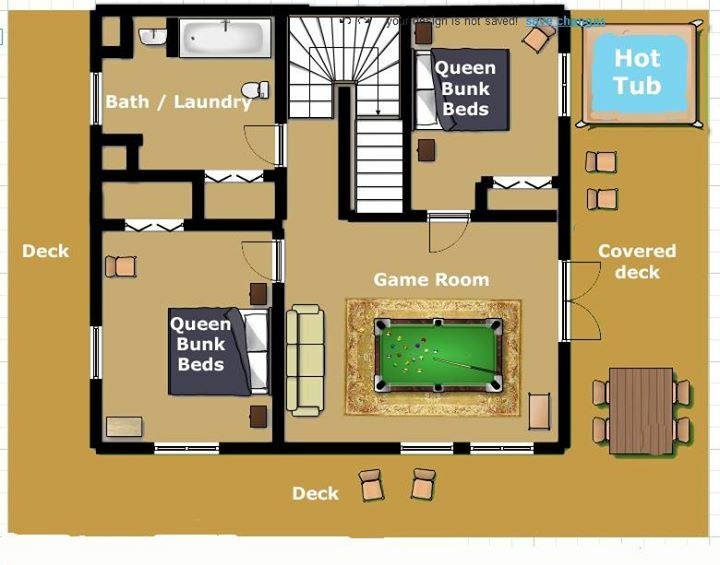 There are two bedrooms on the lower level with queen over queen bunk beds and a full bathroom with a front loading washer and dryer, making this level perfect for the younger generation. 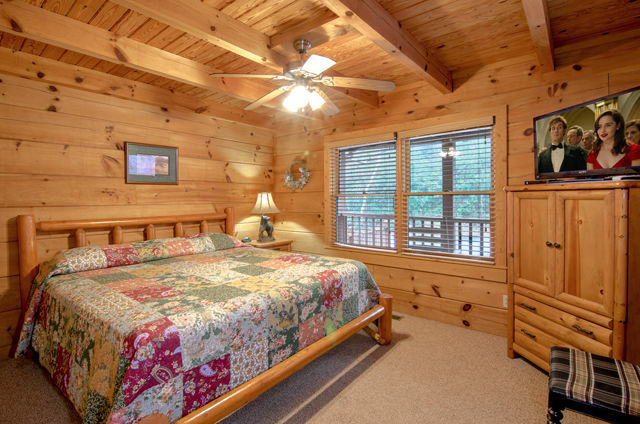 Everyone will enjoy the secluded setting, mountain views and amenities so much you may not want to leave the cabin at all. But if the action of Pigeon Forge and Gatlinburg is calling, you will find them a short 15 to 25 -minute drive down Wear Valley road. Pigeon Forge has a grocery stores, shopping and loads of attractions. There are alpine coasters, Dollywood, the Island, zip lines, theaters and more! If you run out of things to do in Pigeon Forge, Gatlinburg is only a few more minutes up the parkway with plenty more sights to see and things to do. But if you find you prefer the quiet side of the Smokies, then the national park is only a few minutes away in the Townsend direction. 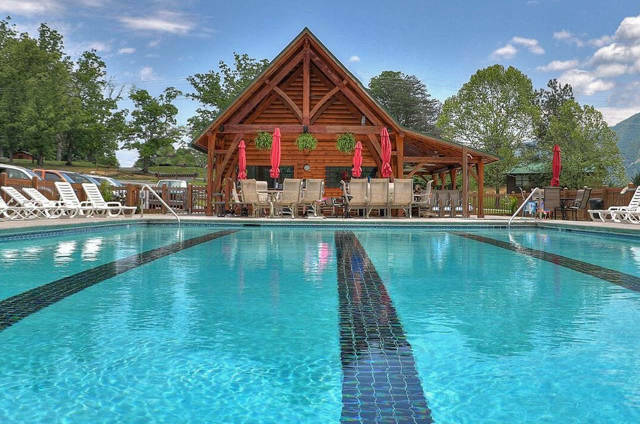 Both Wears Valley and Townsend have good restaurants, shopping and entertainment like tubing, horseback riding, zip lines and the Tuckaleechee Caverns. And of course Cades Cove the number one attraction in the Smoky Mountains is on everyone’s must see list of things to do. Mountain View in secluded setting! We love to share what our guests who have already stayed at the cabin have to say about their experience. Often they say it better than we ever could. Thank you to everyone who has taken the time to share with us their experience at our cabins with us! …shared from our Online Guestbook! My brothers and our families spent the week before Christmas in the Heaven’s View cabin and absolutely loved it. The cabin was easy to find and very private. It was, also, within a short distance of all the major attractions in Pigeon Forge and Townsend. We spent a lot of time at the cabin just hanging out and relaxing. Wonderful!!! We enjoyed our stay very much. Quiet, peaceful, relaxing time with stunning views and close proximity to all the area has to offer. It’s the perfect place and we’ll be returning soon. The cabin was awesome , great location and the feel of isolation is unique to this area. Easy access from highway a plus. Will stay here again without a doubt . Glad we had the opportunity! Without searching too hard for a place to stay for our large group, it didn’t take long to choose this place based on the pictures and reviews. We were not disappointed!! Sooo clean (which is very important to me) and the rooms and views were gorgeous! Calls made to owners for questions were answered right away with pleasure in their voices. The pool is about a mile away and we had to call for directions. Overall, I would definitely recommend this place and will likely be back myself!! Thank you for the beautiful clean cabin!! We had a great time-just wished we could have stayed longer. Your cabin had everything we needed to make ourselves at home. The seclusion was great yet very close to the main highway. And the view was fantastic. As advertised, the beds were very comfortable. I have a hard time finding anything negative about your cabin. The only negative I would say would be having to take garbage off of the property to a dumpster-however it was very accessible when we left going places. Again a wonderful stay in a beautiful cabin. Thanks so much for a great time!!!! Girls trip last year, family trip this year. Perfect place for both gatherings! The view can’t be beat. The resident black bear “Mason”, named by my granddaughter, greeted us upon arrival. Cabin had everything we needed except maybe a screwdriver, hammer and a pair of scissors. Pool was refreshing and close by. We enjoyed tubing, mountain roller coaster and the Titanic Museum. Great restaurants and delicious food also nearby. Thoroughly enjoyed our visit and highly recommend to fellow travelers. Heavan’s View – Truly Heavenly!!! We were 10 of us – a reunion of friends from different parts of the world. Couldn’t have asked for a more fun and serene place to spend the week. The view and surroundings were simply breathtaking. The spacious cabin was easy to access and was equipped with everthing we needed to cook and enjoy our time together. The owners promptly responded to any questions we had. Would definitely recommend this cabin and look forward to returning here in the future. We enjoyed this beautiful cabin and view for a family reunion. It was perfect! We all had an amazing time and would highly recommend it! We have come back to Heaven’s View 3 years in a row. You can’t beat the view, and the house is clean, comfortable, well appointed, and conveniently located for hiking around Cade’s Cover in the park. We love the hot tub and the pool table, but the highlight is lounging on the beautiful terrace after a day in the park. My sister and I brought 3 of our nieces to Wears Valley to tell them about their ancestors that came from that area. Fortunately, we found Heaven’s View and what a view it was. From the deck, the beautiful mountains made a great show. Even though it rained everyday that we were there we had tremendous fun. 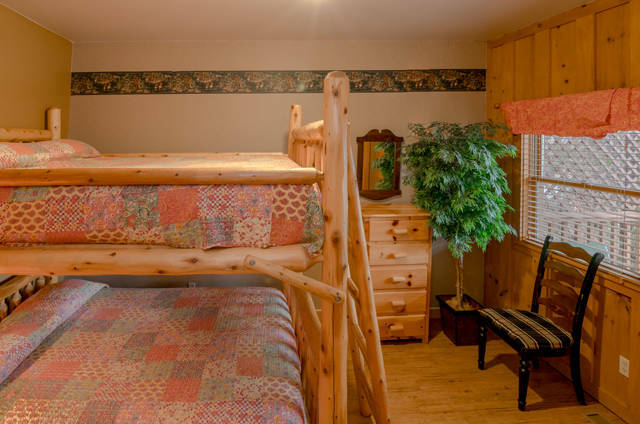 Heaven’s View was equipped with all the modern conveniences we needed and our stay was so comfortable and wonderful. Hopefully, we will be able to come again and thanks to Donn and Margaret for providing this great place. 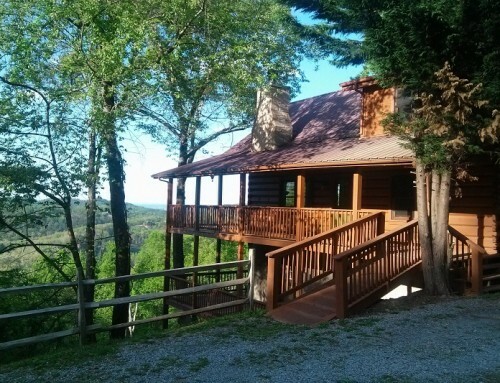 Donn & Margaret, thank you so much for allowing us to stay in Heavens View cabin for our first trip to the Smoky Mountains. It truly felt like home away from home with all the amenities provided. I also appreciate how clean it was! The views of the mountains were breathtaking and daily morning coffee on the deck looking out at them was certainly a highlight. The clean hot tub was relaxing after all the hiking and walking we did. It was great to grill food out on the deck, and have a full kitchen stocked with everything needed. There was plenty of room for the 7 of us to be spread out, the beds were firm yet comfortable, and the privacy we felt was the best. The paved road up the mountain was also a huge plus. We will definitely look to stay in your cabins again. I already miss it – the weather, the views, the welcoming town and wish we’d stayed longer!! Stayed here with several families and it was perfect!! Will definitely stay here again. Would highly recommend this cabin for the perfect getaway!! Beautiful view!! EVERYTHING WAS GREAT. WE HAD A BETTER THEN EXPECTED STAY. The cabin we stayed at was called Heavens View and it was wonderful. The cabin was clean and beautiful we felt lucky to have had Don tell us about this cabin. A little far from gatlinburg but for us that was no big deal and the view was awesome we will be back thanks Don. Such a beautiful cabin I don’t know where to begin!! 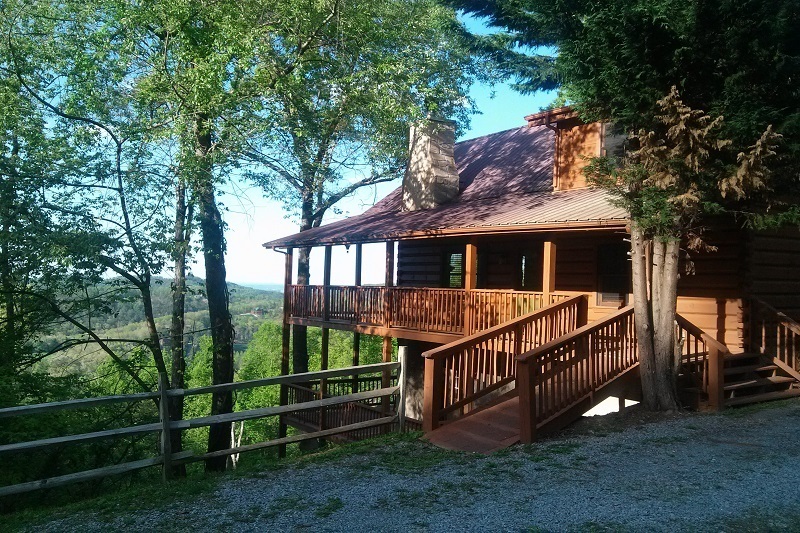 Our 1st trip to the Great Smoky Mtns was totally wonderful beginning with Heaven’s View cabin. Beds were really comfy, kitchen had everything we needed for cooking, plenty of towels in each bathroom, super water pressure and soft water to keep our skin nice, hot tub was enjoyable, jazucci felt great, the pool table was fun, living area room had enough space for 10 adults and 5 children. The deck was a place of solitude even with everyone sitting around. Quite a refreshing time with no worries about needing anything because the cabin was so thoughtfully and well equipped! Each room was unique and very tastefully decorated, ready to come again soon! Donn & Margaret, Our three adults and two boys enjoyed your cabin. The boys loved the pool table and the hot tub was a perfect place for the sunset and star gazing. Kitchen was well stocked with utensils and three king beds with plenty of blankets for the cool evenings. Since our party was small we didn’t use the two (2) downstairs bunk beds. 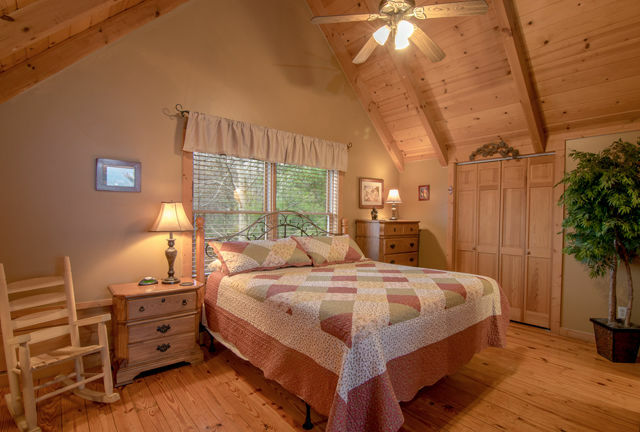 Conveniently located near the entrance to Cades Cove up high on a ridge in Wears Valley. Thank you for sharing your little slice of heaven! 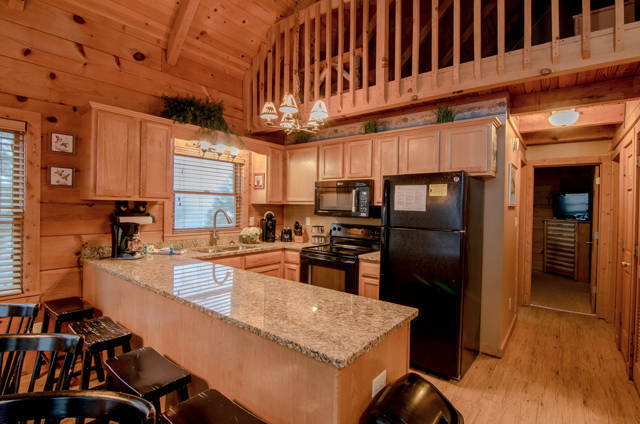 We were very impressed with our cabin, and were lucky enough to get it at a GREAT price! Loved the view of the mountains in the distance! 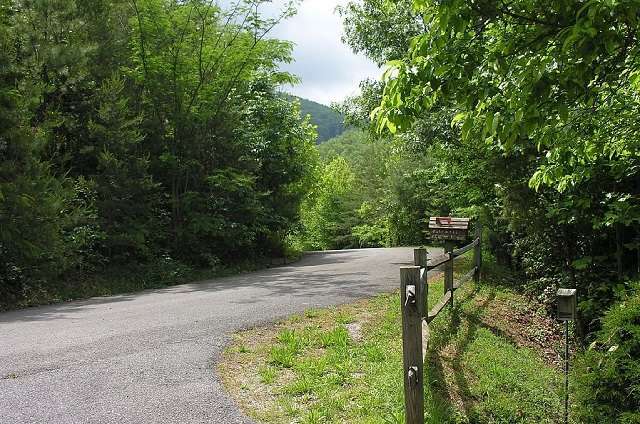 Great location and easy access to get back to Pigeon Forge. The cabin was secluded, which is exactly what we wanted. 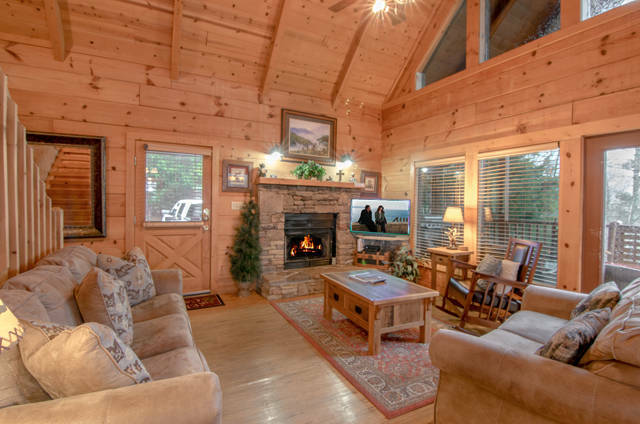 We will definitely keep this cabin in mind for our next trip to the smokies! We had 11 adults travel to Tennessee for the GSM half marathon. We (obviously) did not know the area Donn and Margaret helped us to make sure we were close to the start and finish. We all had enough space to get up and around. The kitchen and bathrooms were stocked to start us and we had plenty of room for us to cook and all eat together. The cabin was lovely. We had some company in the afternoon, with a bear walking around the back yard. This was very exciting to us and just added fun to our trip. We would definitely stay here again and recommend to anyone and everyone. This was perfect for us! The cabin is beautiful, fully furnished. Plenty of room for a large group. The mountain view is wonderful, especially the evenings when storms are on the other side of the mountains – what a lightning show! The area is beautiful – be sure to visit the Titanic Museum. We learned more about the disaster at this museum than another exhibit in Chicago several years ago. Recently my family of 15 and I had the pleasure to stay in Heaven’s View Cabin and I would highly recommend this cabin for a family retreat. 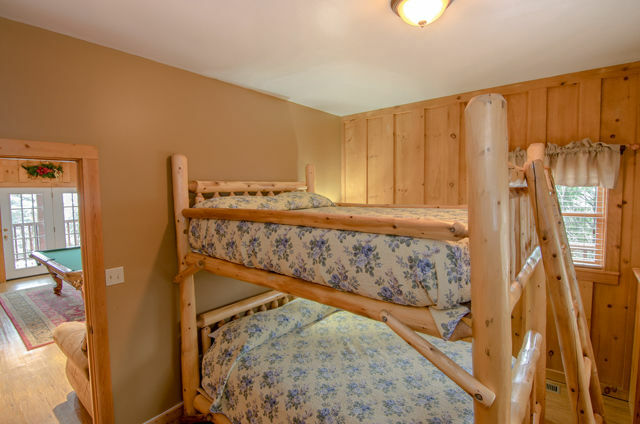 It is a beautiful cabin equipped with every necessity that a large group would need from dishes, to bedrooms , to showers. The view from the main deck is magnificent, even during stormy weather of which we had our share. 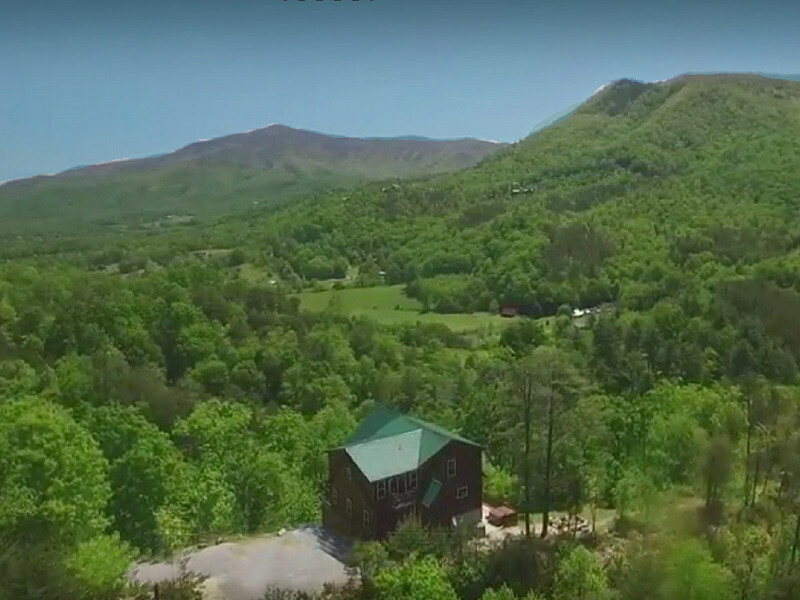 The setting of the cabin lends to a feeling of isolation yet Townsend and Wears Valley are just minutes away. My favorite part was the time with our family sharing love and laughter in this beautiful home. 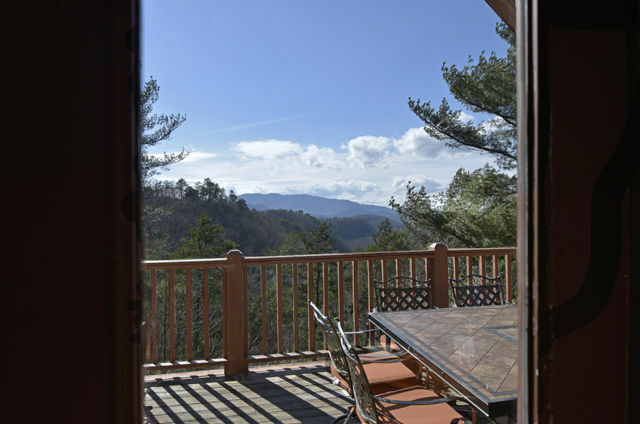 If we are ever given the opportunity to visit the Smokies again with all our children and grandchildren, Heaven’s View is where I would want to stay. Even better than we could have imagined! We thoroughly enjoyed our stay at Heaven’s View! The location was amazing with beautiful views. The cabin was incredibly clean and completely worth every penny. Our family of 16 spent 9 days at Heaven’s View Cabin. My favorite spot was the deck looking out at the mountains. We spent so many mornings and evenings out there. Loved the large dining table that allowed our grandchildren to enjoy meals and snacks while enjoying the gorgeous mountains, fireflies and cool weather. The cabin is close to everything we enjoy while in TN. Don’t miss out on Cades Cove making sure you go no earlier than 6PM if you want to see the most wildlife. Also, stop on the way back at Masterburger for a great burger and the best ice cream! The Ripley’s Aquarium is great for kids and adults. The best food during this trip………PAULA DEEN’S FAMILY KITCHEN! Don’t dare be this close and not go there! We had a great time in the Smokey Mountains! Heaven’s View cabin did not disappoint. The view from the front porch was magnificent overlooking the mountains. On the first night we noticed that one of the pool sticks was damaged and the next day called about it. 2 new pool sticks were promptly brought to the cabin after the call. 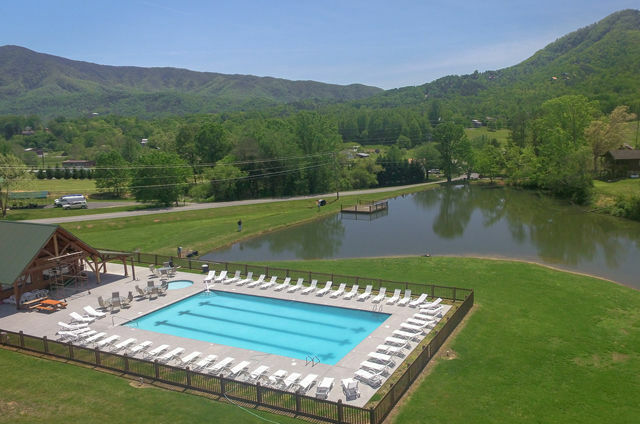 The location is great as it is only about 10 minutes from Pigeon Forge, 30 minutes from Cade’s Cove and less than hour away from white water rafting. The cabin was well stocked with supplies and Donn and Margaret were very easy to work with. I highly recommend Smokey Mountain Golden Cabins and would without a doubt book with them again. What a family treat!! We reserved the cabin in order to attend my daughters wedding in the area. My entire family of 14 coming in from Kentucky, Tennessee, New York and Texas convened at the cabin and all agreed, we could not have done a better job in choosing a place to spend our family gathering together on such a special occasion First of all, “Heavens View” is an understatement, what a fantastic view of the Smokey Mtns. from 3 different levels of back porches no less. The cabin was clean when we arrived, the beds were comfortable and everything actually worked!! 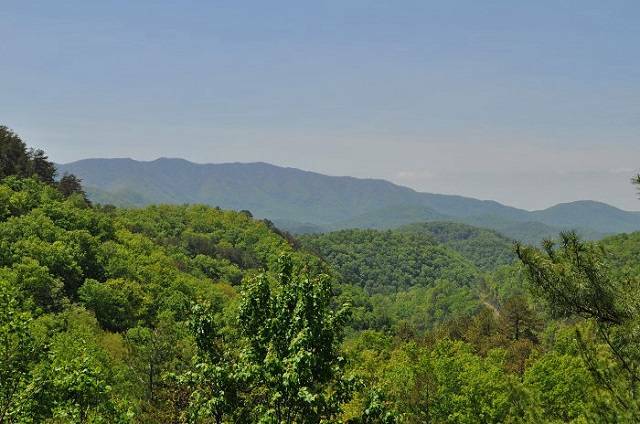 It is also centrally located to all the nearby Smokey Mountain area Naional Park locations, including Pigeon Forge and Cades Cove. From evening cookouts and dining on the back porch during a moonlit night to playing pool in the game room, relaxing in the hot tub after a long day of shopping or hiking or having the family gather around the large dining room table to play our favorite card game, it was perfect!!! And if your lucky, visits from the small furry four legged critters from the woods were a treat for the young kids to view, behind closed doors of course!!! I would highly recommend “Heaven’s View” for any family event that your planning in the future!!!! We have rented this.home for the past three years, staying five days to a week each Spring. It has always been spotlessly clean and well equipped. 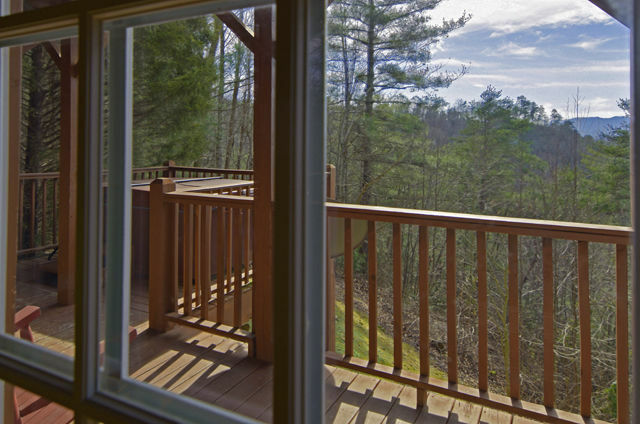 The view from the well-furnished deck is what keeps us coming back! The location is perfect– quiet but close to the park entrance, a good grocery, fried green tomatoes at Beef and Trout, and the best bbq ever at Real Pit (with lovely riverside seating .) 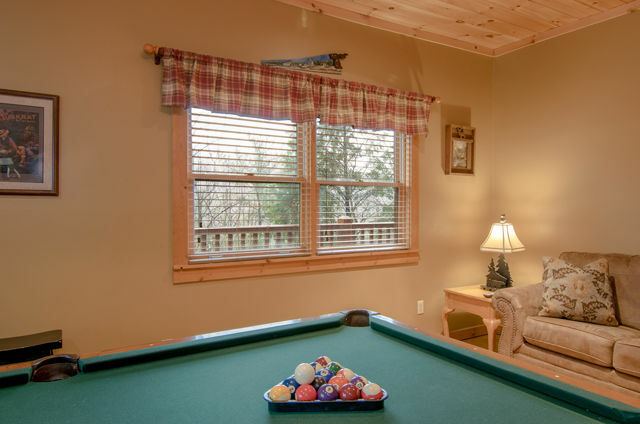 The house can keep everyone entertained with the hot tub and pool table, even on rainy days. HIGHLY recommended. 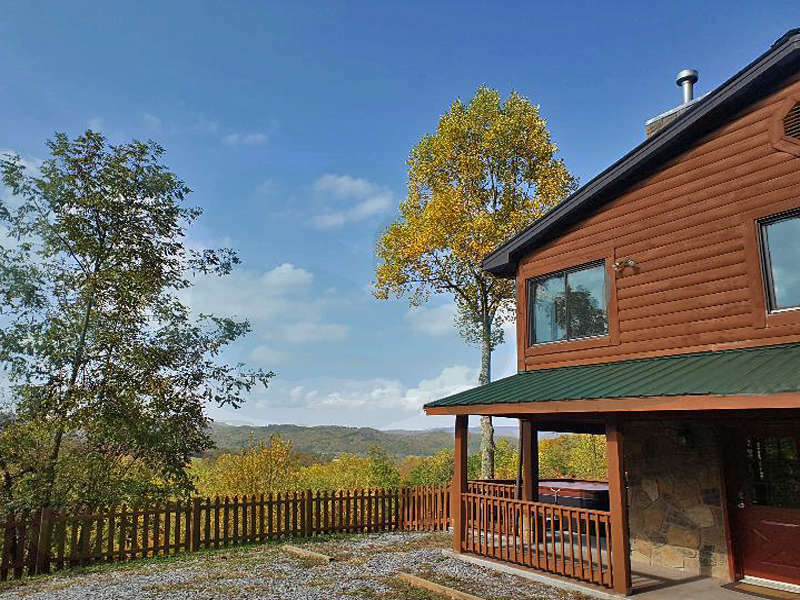 The Heaven’s View cabin was conveniently placed for those who wanted to be tourists, the sight from every window and balcony was an amazing portrait of the Smokies, and the spacious cabin allowed for our 16 wedding party members and friends join us on our special day. It was a great deal, a great time, and we will be doing this again. What a view! We had a great time at Heavens View. Couldn’t ask for more. The only issue I had, was the bottom heating element in the oven burned out but these things happen and are unavoidable. The grill on the porch was very nice so I baked our dinner on it. Thank you for allowing me to rent your cabin. I’ll be back! What a perfectly wonderful weekend we spent at Heaven’s View. From the easy access to the spotless, spacious cabin itself with everything we could possibly need, we couldn’t be more satisfied with the time we spent here. The pictures do not do this cabin justice, it’s much more beautiful in person! Donn was also kind enough to call us before check in to advise us that he had cleared the roadway! I cannot wait to stay here again! Thank you Donn and Margaret for making our winter vacation absolutely memorable. This was our best family vacation ever. We had family from MS and VA meet in Tennessee. There was plenty to do in the area. The cabin had everything we needed for our stay. Would highly recommend the location and the comfort of this cabin to anyone. We will be going back!!!! It was wonderful staying there.I loved it. Awesome view,luxurious facility. My wife hates for me to rave about this place too much because we don’t want to compete with people for it. :o) We have stayed in this cabin for 5 straight years now. 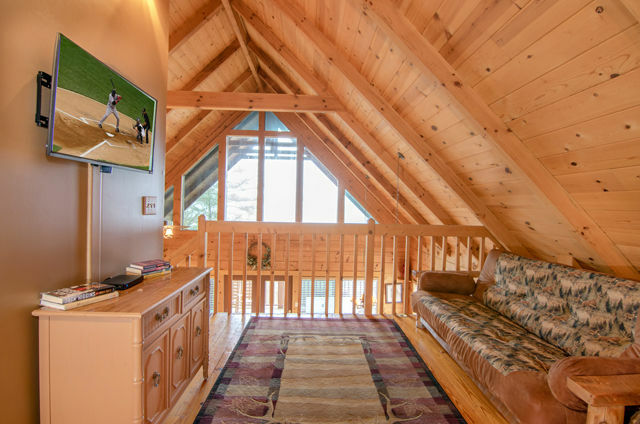 It has a perfect view from the back deck and we wake up to awesome views from the loft every morning. 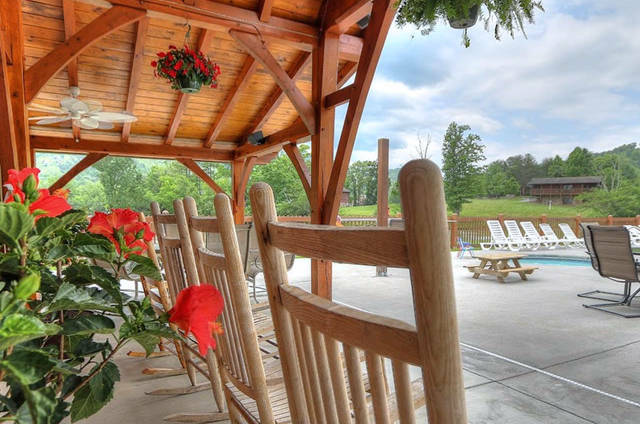 It is perfectly situated between the Great Smokies and Cades Cove and Gatlinburg and Pigeon forge. We will be back again next year for sure. Had a great time in the Smoky Mountains! Heaven’s View is just that. The cabin was very nice and clean. Saw lots of wildlife! Secluded, it was easy to find and close to all the attractions. Would definitely stay there again. Our cabin was clean and inviting and we enjoyed watching the beautiful sunset from the spacious deck.The very comfortable outdoor furniture made it very easy to just sit and enjoy the great view. Amazing Cabin for the Whole Family! Heaven’s View was the most amazing cabin! We have 7 grown children and 3 grandchildren. Finding a cabin for such a large crew can be tough, but Heaven’s View will sleep up to 16. 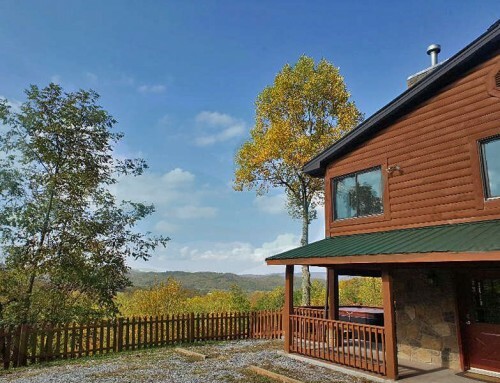 The cabin has an incredible view of the Smoky Mountains. The best part though is how beautifully it is decorated with lots of upscale features like granite counter tops. We had the nicest vacation & my husband can’t wait to come back. Thanks Donn & Margaret for such a great stay! We had 4 great days at your cabin. I loved the view, and big deck. The place is well furnished, and the guys loved the pool table. It got a lot of use. We definitely will try and stay in this cabin when we come down there next time. We had a wonderful stay in the mountains. Your home is beautiful and very comfortable. Our favorite was the deck. 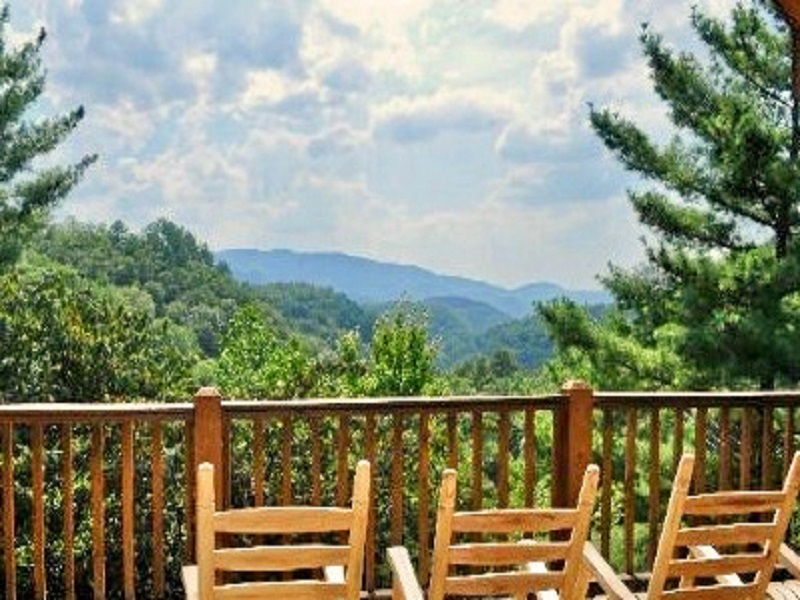 We really enjoyed all your nice deck furniture and the amazing view of the Smokies. 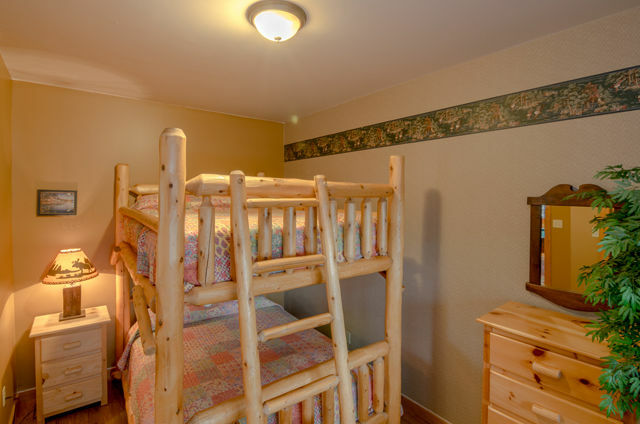 We needed large beds because we had ten adults and that is one reason we chose your place. We cooked all our meals in and we found the kitchen to be quite well equipped. Your location is convenient to the national park and Cades Cove as well as Pigeon Forge as we had a couple of shoppers in our group! Your location was also easy to find and easily accessed as well as convenient to a nice grocery store. We hope to plan another mountain get-away in the future and would certainly love to return to your lovely mountain home. We hosted our annual Sibling Reunion this past week. We chose Heaven’s View as our Venue. What a perfect place for the Reunion. Great location with seclusion yet readily available. Nice and clean. Good family place. 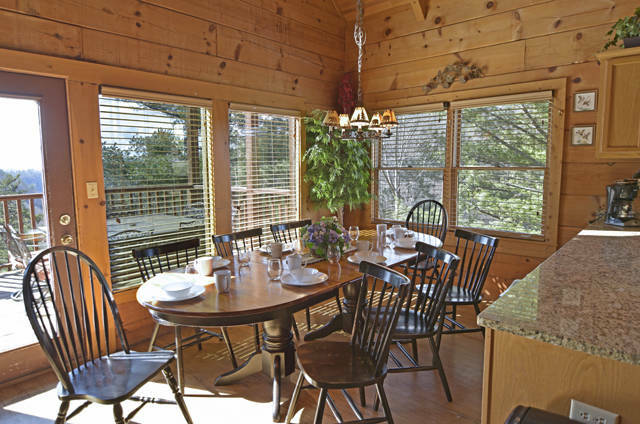 The porch is the perfect place to gather for meals and snacks. Our family voted to hold the Sibling Reunion at Heaven’s View again in the future. Travel times to some popular local area and attractions. 2. PAYMENTS: To make a reservation we require 1/3 of the total rental amount down on a credit card with the balance due 30 days prior to your arrival date. Reservations will be cancelled for failure to pay the balance after 2 days late. The cabin/property will be put back on the calendar and advertised for rent to another party. 4. SECURITY DEPOSIT: A $200 refundable deposit will be collected when your balance is due (30 days before your arrival date) and returned within two days after you check out provided there is no extra cleaning or damage. We reserve the right to bill your credit card if expenses exceed the amount of deposit. 5. INSURANCE/REFUNDS: We strongly recommend purchasing travel insurance for unintended cancellation, disruption of utilities, inclement weather, Acts of God, accidental damage, accidents, injury, break downs, medical emergencies and any other unintended consequences. We do not refund money for early departures, power outages, inclement weather or other disruptions to appliances, amenities or any of the conditions (afore mentioned or not) that is beyond of our control. 6. CHECK /IN TIMES: Check in time is at 4 pm. On certain days/times of year the cleaning crew is very busy. They do their level best to have every cabin ready by 4 pm. Every effort will be made to have your cabin ready by 4 pm, but we do not give refunds or compensation if it is not ready on time. Likewise, if your cabin is ready early, you’re welcome to check in up to two hours early and we do not charge for that. (Please contact our office on the day you arrive to see if your cabin is ready to check in early). 7. CHECK /OUT TIMES: Check out is before 10 am. It is necessary that the cabin be vacant and ready to clean when the cleaning company arrives. There is a late charge of $50 per hour for anyone checking out after 10 am. A) Leave the beds unmade. Put towels & linens in the bath tub. B) Wash Pots, pans and dishes, put them away in cabinets. Load breakfast plates in dishwasher and start. C) Take trash to Black Bear Hollow dumpster at the bottom of the hill or leave bagged in the kitchen. D) Lock all doors and windows. E) Set thermostat to 70 degrees. F) Return furnishings to where they were when you checked in. Leave televisions in a connected/wired/programmed condition in which you found them. G) Please leave the cabin and grounds in the condition you found it. 8a. LOST/LEFT ITEMS: If we are able to find any items left behind and return is requested, a $25 handling fee plus postage will be charged for all items returned. 9. SMOKING: All of our vacation homes/cabins are Non-smoking. You may smoke outdoors if you safely dispose of, extinguish smoking material and pick up your cigarette butts. 10. NO PETS: This is not a pet friendly cabin. 11. PARTY POLICY: We do not allow parties of any kind. We reserve the right to ask anyone to leave the property without notice or refund for having a party. 12. VISITORS: Non-paying guests are not allowed unless permission is granted in advance. 13. PARKING: There is parking for 4 cars in the driveway. 14. WINTER DRIVING: It is possible for there to be snow and/or ice storms during winter months. We will make every effort to plow, salt and assist you in reaching the cabin (time, supplies & equipment permitting). We are not responsible or liable for the weather, condition of the road/driveway or your ability to reach or depart from the cabin. If you do experience problems call us immediately and we will do all we can to assist you. 15. IMPROPER USE OF PROPERTY: We reserve the right to ask anyone to leave our cabin/property without notice or refund for any kind of improper use of the cabin. Abusing our vacation home is not allowed and we reserve the right to bill your account for repairs, cleaning, damage or loss caused that is outside of normal wear and tear. 16. ACCESSIBILITY: It may be necessary on occasion for us to gain entry into the property during your stay (for example: scheduled pest control) we, our representatives and/or maintenance personnel reserve the right to enter the property if necessary. We promise to keep this to an absolute minimum. 17. CLEANING: The cabin/property will be inspected and cleaned after departure. The cleaning fee includes laundering of bedding, linens and towels. Tenants are required to leave the property in the same general condition that it was found/received in by making sure that dishes are washed and put away. And that the property has been picked up, furnishings replaced, televisions programed/connected/working, and the property is ready to be vacuumed, dusted and laundered. 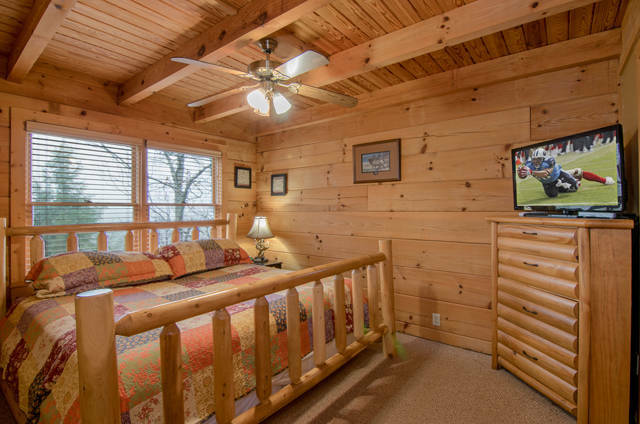 17a, FURNITURE: This cabin is privately owned and decorated to the owner’s personal taste. Please remember that this is our personal vacation cabin and treat it with care during your stay. Do not move furniture. You may incur an additional charge for housekeeping to reposition furnishings and décor. 18. HOT TUB: You and your guests use the hot tub at your own risk. You must keep the hot tub covered when not in use. You must read and follow all directions and safety procedures before using the hot tub. They are posted near the tub or in the cabin book. Do not sit, stand on or damage hot tub covers. 18a. POOL TABLES: Do not attempt to move the pool table. You will be held responsible for repairs or replacing the pool table. 18b. BBQ GRILL: If you use the grill you are responsible for cleaning it after each use. We provide the propane as needed for the grill. If you find both propane tanks empty, just give us a call and we will have a full one delivered as soon as possible. 19. AIR CONDITIONER: Do not use the Air Conditioner or Furnace with the windows or doors open. Do not use the Fireplace & Air Conditioner at the same time. This is a waste of gas and electricity, causes the unit to freeze and will cause permanent damage to the unit leaving you without heat or air condition for duration of your stay. Please be responsible. 20. FIREPLACES: All fireplaces are seasonal. Depending on weather, they are usually turned on in October and turned off in March. All fireplaces are on a timer. Do not attempt to light, adjust or cook on fireplace. Do not move the logs. 21. FIRE WORKS: Shooting or Possessing Fire Works at any of our cabins/property is prohibited. 22. WILDLIFE/PESTS: Welcome to the mountains! We do have wild animals in the woods. Insects and pests are not uncommon in the mountains either. Each property/cabin is routinely inspected and treated for insects and pests. Do not leave doors or windows open. Do leave food out on the counter. Do not encourage insects, pests or wild animals. Please help us maintain the cabin for future guests. 23. LIMITS OF LIABILITY: By renting this property and signing this document you are assuming all risk and liability for any damage or loss done to persons, property, agents, employees or visitors occasioned by the present or future condition of the premises, both latent and manifest. 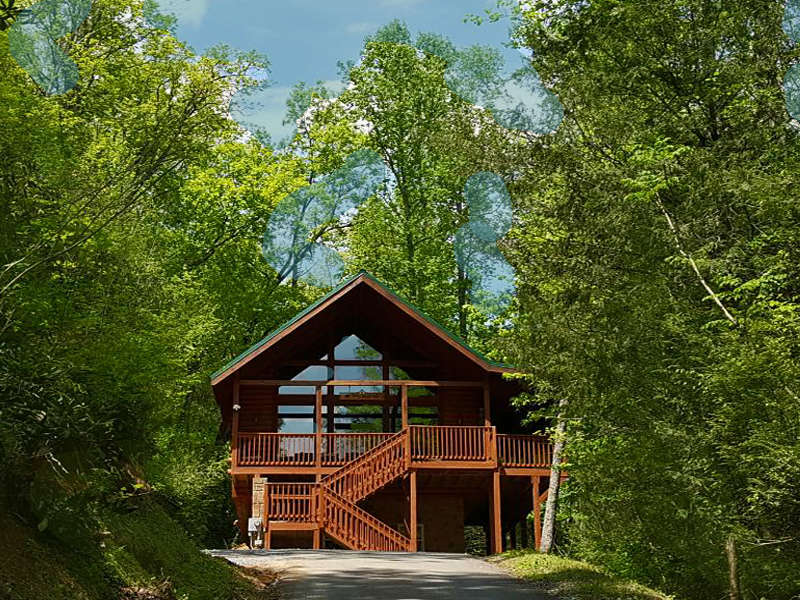 Smoky Mountain Golden Cabins, the owners, Donn and Margaret Tisch, their employee’s or contractors are not responsible for any loss due to theft, items left behind, accidents or injuries to guests or visitors due to negligence or lack of personal responsibility. 24. ATTORNEY COSTS: If Smoky Mountain Golden Cabins or its owners, Donn and Margaret Tisch employ the services of an attorney to enforce any of the conditions of this agreement to collect amounts due, damages or losses, then the tenant shall be liable for attorney fees and costs incurred by them. 25. Amenities Liability Waiver/Hold Harmless Agreement: Please acknowledge that neither the property owner, or Smoky Mountain Golden Cabins is liable for any “bodily injury, or death” caused as a result of the use of amenities at this rental property, except under pure negligence on the part of the owner or Smoky Mountain Golden Cabins. Amenities are defined as (Swimming pools, hot tubs/spas, saunas, exercise equipment, small watercraft, bicycles, fire pits, playgrounds, fishing, recreation areas, and similar). New for 2016 at Golden View Lodge! Golden View Lodge update 2015! Family Memories decorated for Christmas! Family Memories cabin 2016 updates!